Hünkar Beğendi translates as something like "sultan's favorite". All the recipes I found suggest stewing bite size pieces of lamb in tomato sauce. However what we had at Hünkar definitely didn't have any tomato. It also looked like the lamb was cooked whole and then flaked into chunks. Experiments led to braising lamb shoulder in a very low oven with very simple non prevalent spices. That incredibly silky eggplant mash also tasted like a mystery. There was just no way for eggplant to hold such a creamy and thick texture. Here web search did help a lot as the main stream recipe actually produced something very similar to what I looked for. It turned out to be simply thick bechamel sauce with some charred crushed eggplant mixed in. It is a great homey dish in a sense that it doesn't take too much effort. You just need to plan a bit ahead as the lamb will need a couple of hours of slow oven cooking. If you at all like lamb or would like to develop taste for it I so much recommend trying this dish. Wine will be a great complement, but it really should be white wine. I know lamb is normally served with red wine, but I'm sure you will agree this shouldn't be the case here as soon as you have your first bite. To make the lamb preheat the oven to 250C. Lay the lamb into a deep baking dish. Place the garlic, onion and carrot around. Drizzle with olive oil and cook in the oven for 20 minutes, so that the meat and vegetables brown on the outside. Take out of the oven. Turn the oven down to 150C. Into the baking dish add the bay leaves, peppercorns, salt and pour in 400 ml of boiling water. Loosely cover the dish with foil and return to the oven. Cook for 2 hours or till the lamb is extremely tender and melting. Take out of the oven and let stand for 20 - 30 minutes. Take the meat out and flake it off the bones into bite size pieces (with your hands or using two forks). Place the meat into a bowl and strain the juices from the baking dish over it. Keep warm till you serve it. To make the eggplant mash preheat the oven to 250C. Make several cuts on each eggplant. Place the eggplants on a baking sheet covered with foil (not oiled) and roast for 45 - 50 minutes, until they are completely soft and the skin starts to turn black. Take out of the oven and let cool. Cut each eggplant in half and take off the skin (it will easily separate) or scrape the flesh out with a spoon. Cut the flesh into roughly 5-7 mm cubes. In a medium pan melt the butter on medium heat. Add the flour and cook for 2-3 minutes stirring till it gets ivory color and nutty aroma. Take the pan off the heat and let cool for half a minute (to prevent the lumps). Pour in the milk and whisk till the flour dissolves into it. Return the pan to low heat and bring to boil stirring constantly. Cook stirring for 3-4 minutes till the sauce thickens. Take off the heat, mix in eggplant flesh, cheese and salt. Taste and add more salt if necessary. 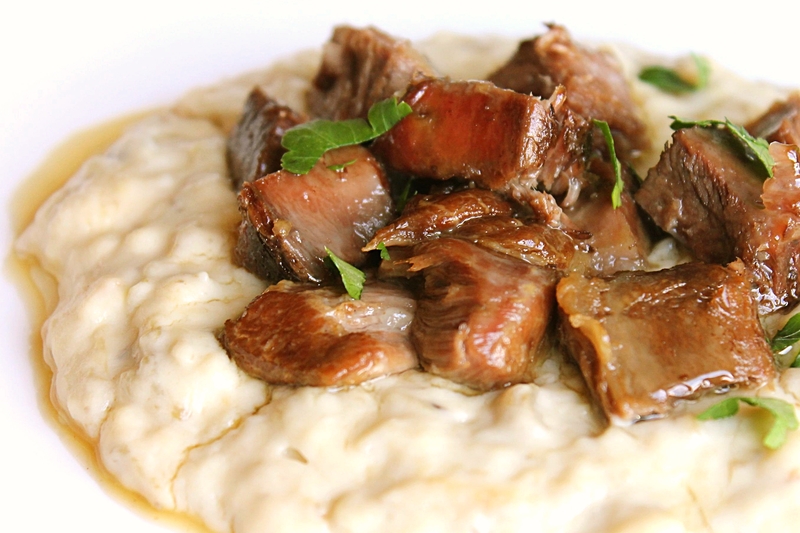 Spoon the meat together with the juices over a bad of warm eggplant mash and serve.